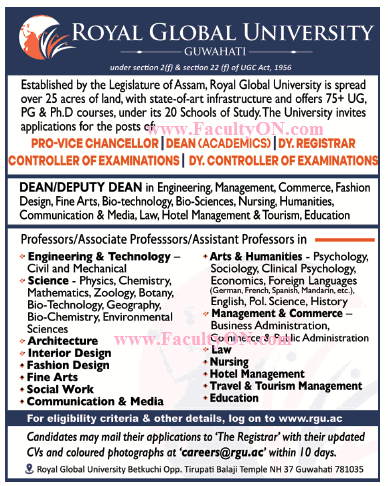 Royal Global University, Guwahati has advertised in THE TIMES OF INDIA newspaper for recruitment of Professors / Associate Professor / Assistant Professor / Dean / VC Plus Non-Faculty jobs vacancies. Interested and eligible job aspirants are requested to apply within 10 days from 04th April 2018. Check out further more details below. About University: Located against the picturesque backdrop of Tirupati Balaji Temple on National Highway 37 and founded in 2009, Royal Group of Institutions (RGI) stands high with its virtues of excellence and a humble contribution to the society at large. RGI offers a unique educational experience that prepares the next generation of global citizens to lead and make a difference in the world. With its talented and motivated student body and accomplished faculty, RGI is a leading educational institution in the NE region that maintains a particular commitment to exceptional undergraduate and postgraduate instruction. How to Apply: Interested candidates are requested to send updated CV along with copies of certificates and recent passport size photo to the email address provided below.